Army Staff Sgt. 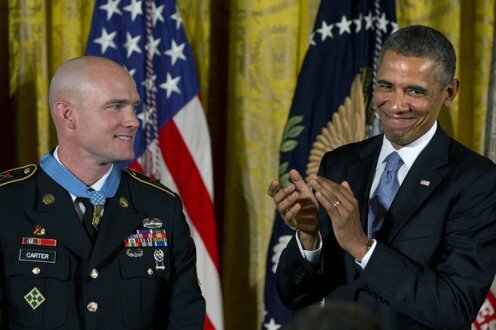 Ty Carter received the Medal of Honor this afternoon, a fitting tribute to a man who repeatedly braved enemy fire in Afghanistan while defending Combat Outpost Keating from a fierce Taliban attack in 2009. Before serving in the Army, however, Carter served as a Marine — and overcame a significant family tragedy. As reported previously, Carter left the Marine Corps in 2002, after getting busted down a rank to lance corporal for fighting with another Marine. He eventually decided to give the military another try, joining the Army in 2008. It looks like that has worked out for him well. Congratulations, Staff Sgt. Carter. I have to agree with Dave. While he may have had a painful experience in life, that has nothing to do with his conduct as a Marine. This headline implies something of that nature. Getting busted down for fighting is something that happens on the reg. I’m sure he was an outstanding Marine, as well as he obviously is an outstanding Soldier. Semper Fi SSgt. Job well done. His brother died, which while tragic, had nothing to do with his service. What kindergarten journalism class did you idiots fail to get a headline like this? Major life events, such as early and tragic deaths of siblings can most definitely alter one’s life path and decisions. So, Dave, I would have to disagree with your preposition that one’s life (military service) is not affected by the events in which it occurs. Does your past affect your decisions? Sure. Is it an excuse or for any matter actually relevant? Not really. Thank you for your service, Sgt. Carter. Know that Smokeless Cannabis Remedies will serve you well if you suffer from PTSD. I don’t believe SSgt Carter is making any ‘excuses’. So O T H whatever you are eluding too, may be irrelevant . A simple risk assessment of this base would have shown it was an easy target. It could be attacked on all sides. I have been in countless exercises where we had to map out pre planned targets even for air support. I don’t believe they had any. So tell me – Where is there any accountability for this failure? Granted that there were hero’s who went above and beyond but you have people who have escaped accountability.